Backup of any application: SQL Server, Outlook, Exchange, etc. Iperius can backup any file on your Google Drive account, which can amount to several TB of space. This allows you to automatically backup your data online, safe from natural disasters, theft or virus attacks such as ransomware (cryptolocker, locky, etc.). On its Google Drive space, Iperius is able to re-create the entire structure of the folders you want to copy, therefore preserving an exact copy of your files online. The incremental or differential backup also allows you to speed up uploads following the first full backup (by sending only new or updated files), and also to have a history of file changes. With Iperius you can create several backup procedures, even with various schedules, to create multiple copies of your data. This allows you greater flexibility, and the chance to recover changes made to a file at any one time. Finally, Iperius allows synchronisation, which means it can eliminate files from Google Drive that no longer exist in local folders, while maintaining mirror copies. You can integrate incremental backups even with compressed and AES 256-bit encrypted backups. This allows you to make backups of specific folders with confidential data, to add an additional level of security to your Google Drive space (even if it were breached, no one could read your files). Compression also allows you to save space and transfer bandwidth. Iperius is one of the best software to perform backup on Google Drive, thanks to its high configurability and numerous options. In fact, you can choose different methods of path creation, create folders with the date or with names of the computers, limit the file upload bandwidth (to avoid consuming all the internet bandwidth), send files in use or locked (VSS) , schedule multiple backups. 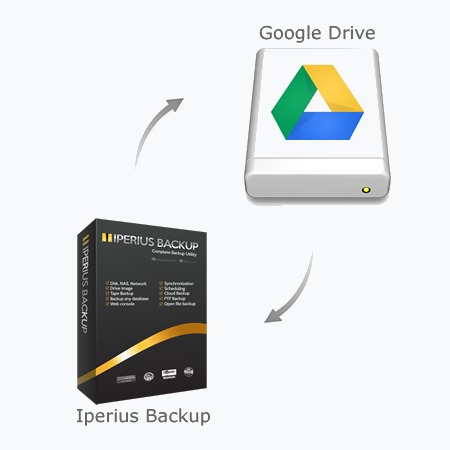 With Iperius you can save any type of desktop or server backup on Google Drive. For example, you can backup the SQL Server database, compress, encrypt, and send it to Google Drive, in a fully automated way. You can do the same thing with ESXi or Hyper-V virtual machines, backup Exchange Server or Outlook. Using applications provided by Google, you can also synchronise backups you make with Iperius on Google Drive with other devices, space permitting. If you send documents with Iperius backup on Google Drive, these can then be synchronised or downloaded, even on a mobile device like a tablet or Android smartphone, in a completely automatic way.